Α.Μ. 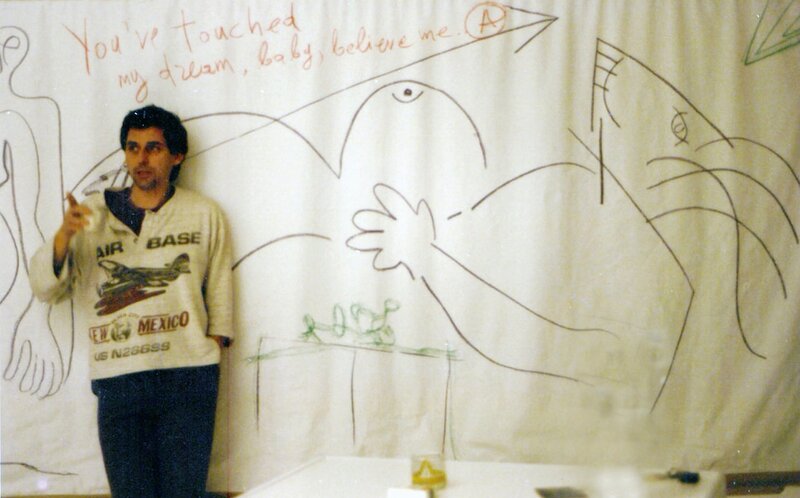 in front of the sketch for a large scale canvas painting. Circa 1987-89. Αll this industry constitutes in the course of his life time a whole workshop in progress. A.M.'s workshop is a private niche of artefacts, a field of experiment, a personal museum etc. etc. etc. ​If you desperately feel the need to SEE, sooner or later you begin TO TOUCH; you touch everything at your hands' reach: the soil, the plants, other animals of your kind. You get smeared with pigments, or you let your sweat blend freely with blood and dirt while scribbling down an impossible idea. For you to see means to attempt your timid steps towards Beauty and Truth in all possible forms. This is what children do in their strenuous effort to grow up as fast as possible. ''Sleeping Venus'', oil on canvas by Giorgione, c. 1510, landscape background by Titian; in the Gemäldegalerie Alte Meister, Dresden, Ger. 108.5 ×175 cm.Sachsische Landesbibliothek/Abteilung Deutsche Fotothek; photograph, B. Walther.